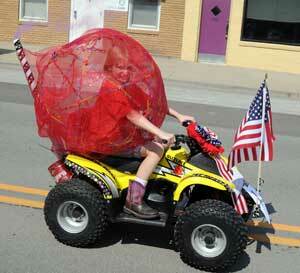 A roving smoke bomb parades down Topeka Avenue during last year’s July 4 celebration at Lyndon. It’s happening again this year at Lyndon – a good old-fashioned Independence Day celebration. On July 4, 2016, the Lyndon community is again inviting all to spend the day in town celebrating their freedom, with a patriotic parade, town picnic in the park, games and prizes, and free cold watermelon. Then cool off a sizzling Fourth of July with a free swim at the Lyndon swimming pool. The day of celebration begins at 7 a.m. with a pancake feed at the Lyndon Community Center, sponsored by the Lyndon Lions Club. After everyone gets filled up at breakfast, the Firecracker 5K starts at 7:30 a.m., beginning at the community center. The 5K run or walk is open to all skill levels, with proceeds benefitting the Lyndon High School cross country team and Lyndon Pride. At 10:30 a.m. the annual patriotic parade begins, with awards given for best musical act or band, best overall float or group, best walking entry, best business entry, best equestrian entry, best bicycle or wagon entry, best antique or classic car, best tractor, best police or fire vehicle, and mayor’s choice-most spirited. Anyone who wants to be in the parade should gather at the Lyndon High School parking lot at 9:45 a.m. To register, contact Lyndon City Hall at 785-828-3146. The intersection of Sixth Street and Topeka Avenue is suggested as the best viewing spot for the parade. Starting at 11:30 a.m. will be the old-fashioned picnic in City Park. Free watermelon will be available while it lasts, and the Masons will be selling picnic lunches 11:30 a.m.-1 p.m. From 11:45 a.m. to 2 p.m. will be games for all ages, such as nail driving and more, along with prizes. Then in the afternoon until evening, everyone is invited to cool off at the city swimming pool, with free swimming offered to all. The celebration is hosted by Lyndon Pride and the city of Lyndon. For more information, contact Lyndon City Hall at 785-828-3146.